First church sale for us this season. Love church sales. Love them. Added more dried hydrangea (see Front Porch Post) to some of my finds. Dried the hydrangea in the cone juicer (they are now 'one') and balanced the bouquet in a vintage bowl. Such wonderful muted colors. The 'find' was the board with You are my Sunshine. Vintage crochet BREAD tray doily. These are the last of the sweet peas and most likely the last Dahlia too. 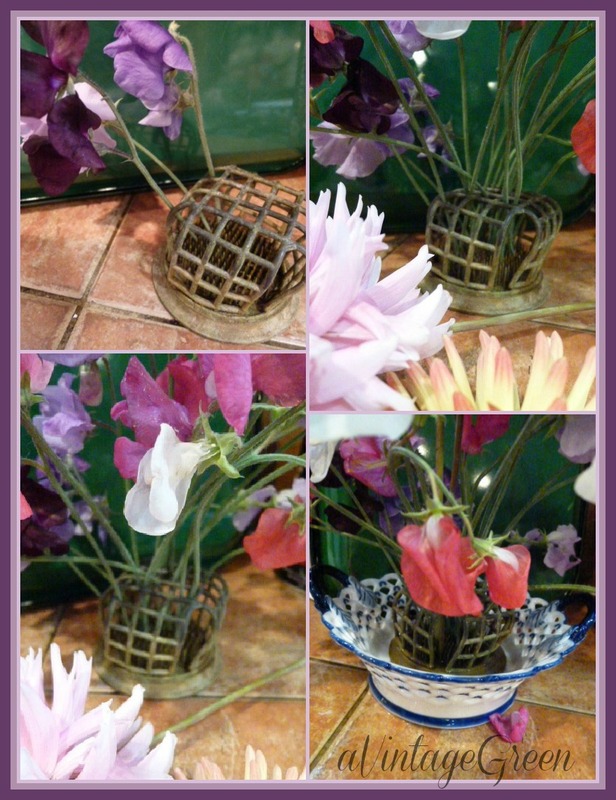 The 'finds' were the metal basket covered flower frog, the silver plate teapot and the tiered sweets server. Used the frog to tweek my Autumn bouquet. Just thought I would show 'how' I used the frog. Eveything looks lovely. I especially like the Bread tray doily. You are my sunshine... I'll be humming that all day. Love the frog. "You are my sunshine . . ." That was the first song I learned to play on the piano! Thanks for sharing your beautiful dried blues. Great post nice finds the flower frog is very handy. 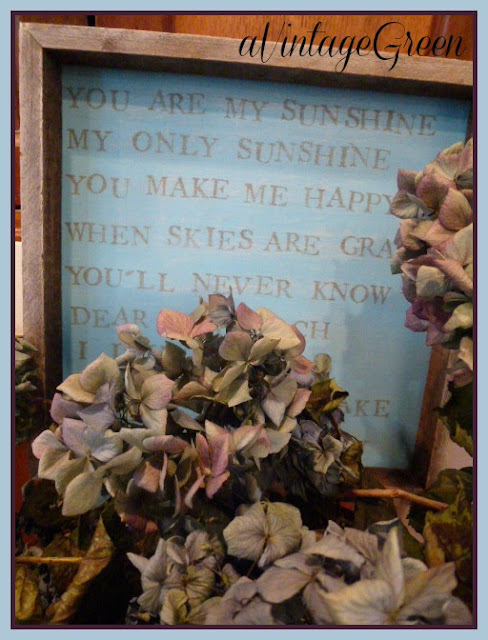 The flowers are beautiful and You Are My Sunshine! ttys. As always, your comment will add delight to my day. I remember crocheting one of those bread doilies. I wonder if you found it!!! Love the silver teapot!!! Love the 'bread doily'... so cute! HBM! Love the flower frog and the teapot is great. 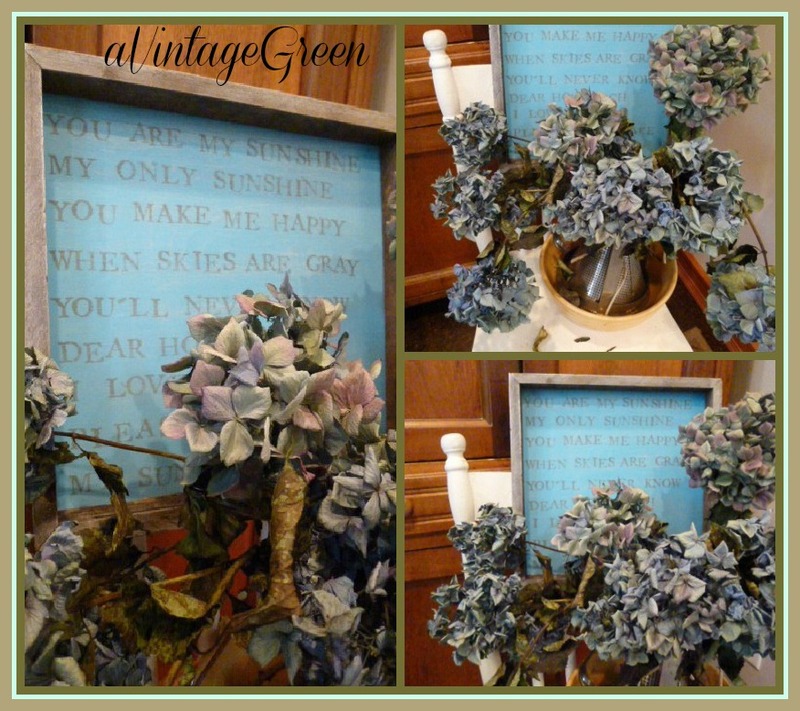 Wonderful finds, and I love the beautiful dried hydrangeas. Your hydrangea is just the perfect shade. I'll go check out your front porch post to see what you did with them there. I agree, church sales are the best, they always have such good prices too. 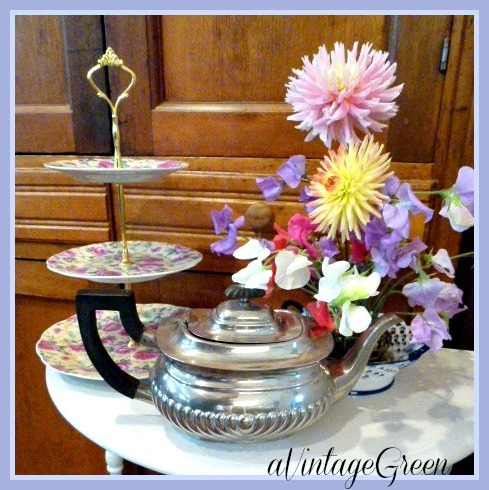 Fabulous finds, my favorite is the tea pot and I love your hydrangeas. Your silver plate teapot is lovely! What a great display. Have a great VTT! You found some wonderful things! Love your pictures and your header! Thanks for visiting. New follower now! 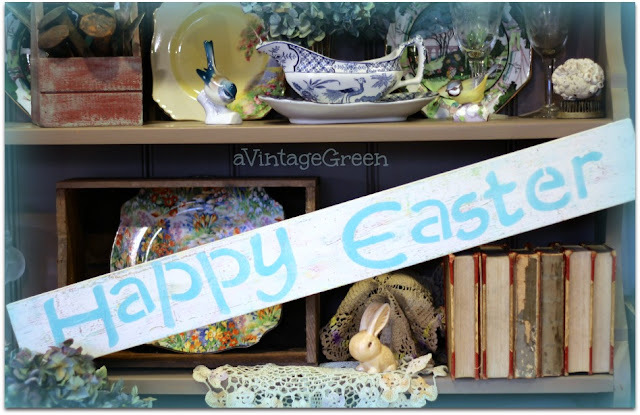 I do appreciate you sharing this lovely post with Home and Garden Thursday, I will be featuring your post in this evening's party!